"There's a bit of a story behind this picture. This was taken out of my mom's kitchen window as I was pleading with her to go to the hospital. Longer story short she is having open heart surgery tomorrow, Valentines Day. But my grandmother, my moms mom had everything cardinal in her house down to the salt shakers and magnets on her fridge. She passed 6 years ago but I told my Mom that grandma had sent reinforcements. There are 7 in this shot but there were 25 or more outside. She is my guardian Angel she sends me cardinals every time I need them." Such a beautiful photo. Hope the surgery went well. Hi A ~ been thinking of you and always hoping your happy and healthy xo. 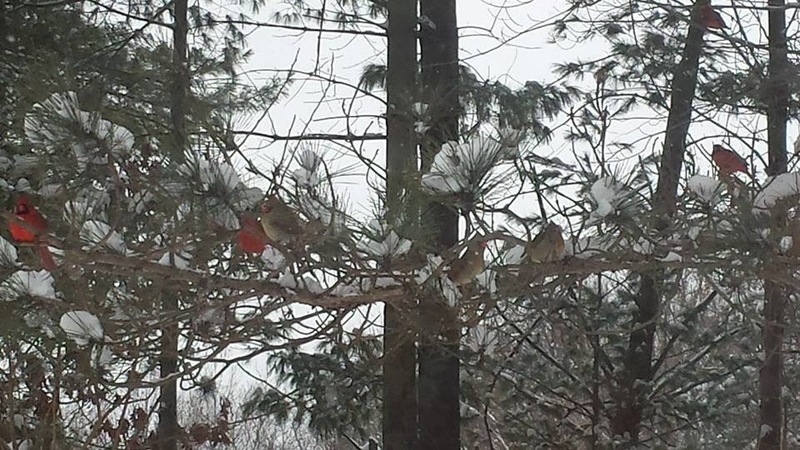 I posted a video last week from a lady who lives in the midwest and video taped at least two dozen cardinals in her back wilderness. AMAZING - magical acutally. The surgery went well for my LRB friends mom and I believe she is recovering nicely.